The burning of books and the burning of people are two of the actions for which Nazi Germany is most infamous. Are the two connected? Curiously, the idea that the former would lead to the latter was famously predicted more than 100 years before the Nazi takeover of Germany by German author Heinrich Heine. What did he understand that others do not? What is the connection between burning books and burning people? The first point to consider is why people would burn books at all. The Nazis didn’t burn just any books, they burned the books of Jews, communists, socialists, and other “degenerates.” They didn’t simply burn books which they found disagreeable, but the books which advocated ideas which they believed would undermine the health, safety, and welfare of the German nation. People don’t burn books simply because they disagree with the message of the books; they burn books because the message of the books is a threat — a serious threat, in fact, not something remote and theoretical. No one goes around burning the books of fringe groups which don’t pose a real threat. Burning books, however, doesn’t eliminate whatever threat they might pose. Books are merely the means by which a message is communicated; eliminating them may slow the growth of the message, but it certainly can’t eliminate the message itself. To be fair, it’s unlikely that a message could ever really be eliminated, but people who burn books probably won’t believe that. If they truly want to eliminate a message which they perceive to be a serious threat, they will have to go to the source of that message — the people responsible for the books. Shutting down publishing houses is one step to take, but shutting down the authors themselves will be necessary at some point. Is it enough to simply lock these authors up and prevent them from talking to others? That’s expensive and it isn’t permanent — after all, they didn’t take the books and shut them up in a warehouse. Permanent elimination of the message requires permanently eliminating the authors of the message. If books can be burned to destroy them, why not burn people to destroy them as well? This eliminates the message and all trace of the messenger as well. Burning books and burning people are connected because both stem from a desire to eliminate ideas that are a threat to some group or ideology which is in power. 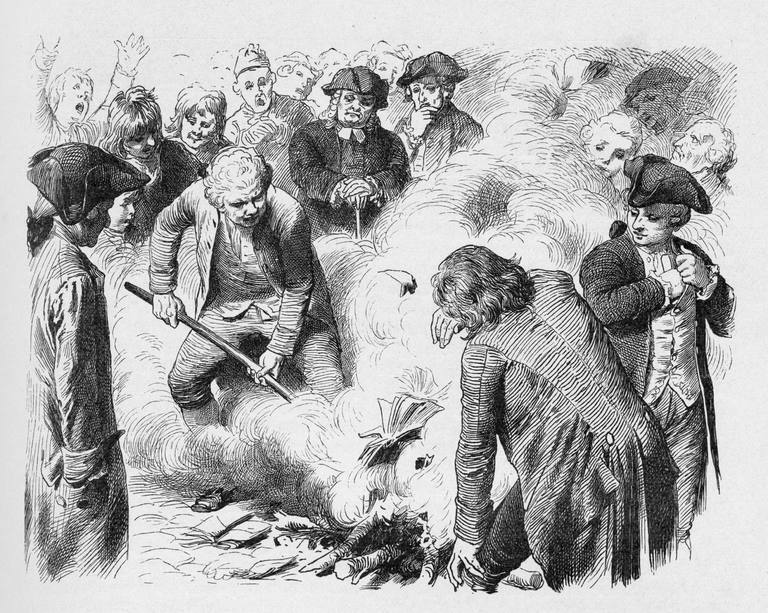 Heinrich Heine recognized that such a connection could exist and perceived that once people could be persuaded to burn books, then at least some of them could be persuaded to take the further step of burning those responsible for the creation of those books. Perhaps they could even burn all those connected in any way with the degenerate ideas in these books which, if allowed to propagate, might threaten the nation itself. Most people probably don’t think about or see these connections, but they must recognize that something sinister is going on when books are burned. Perhaps it’s simply that such an action reminds people of Nazi Germany, but many appear to be repulsed by reports of books, music, or other media being ceremoniously burned by self-righteous groups. Maybe if the connection between burning books and burning people were made more explicit, the general social condemnation would be louder, making it more difficult for people to choose to burn books in the first place.